No rust and edges are sharp and straight. I tried to show a closeup of the edge in the last photo. Country: Made in Austria. This board is SNOW-READY! 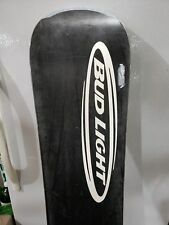 BUD LIGHT Palmer Snowboard Austria 158CM Beer Board Rare. Great shape collectable Palmer snowboard made for Bud Light. Size 158. Light scratches and binding marks, see photos. Good Used Condition. Some Roughness on Edges. (Please See Pictures). Nice Color. Nice Graphics. No Breaks. The graphics alone make this board, but we also threw in a 5 X 2 insert pattern for more stance options. ADD THIS SNOWBOARD TO YOUR COLLECTION! BOARD SIZE 148 cm. LENGTH 1480 mm. WAIST WIDTH 237 mm. Willing to separate the board and bindings if you'd prefer one or the other. Shaun palmer snowboard with Dakine bag. Condition is Used. Shipped with USPS Priority Mail. The base and edges are very clean with no major nicks, or scratches and the top graphic is in very clean condition. Das Crown mit Titanium-Power glänzt mit Leichtigkeit und Fahrspass ohne Ende, dank unserem revolutionären FLF Shape. Einfaches und kraftsparendes Handling gepaart mit Power, machen es super snappy und wendig. Die einzigartige FLF Technologie mit Cap-Sidewall Konstruktion und Nomex Honeycomb in Tip und Tail, für reduziertes Schwunggewicht, vermitteln unbegrenzten Fahrspass und spielerische Kontrolle. 4 Titanium Inlays und 4 Tip-to-Tail Carbon Streifen sind verantwortlich für Power und rennmässige Stabilität und die 7200 Graphit Rennlauffläche mit Steinschliff, machen das Board zudem wendig und pfeilschnell. Diese neueste Shape Generation beinhaltet das FLF Technologie und eine superleichte Nomex Honeycomb Kernkonstruktion. Diese Bauweise ermöglicht ein einfaches, kraftsparendes Handling, mit einer präzisen und direkten Schwungsteuerung – für Fahrspass ohne Ende. Die 7200 Graphit Rennlauffläche mit Steinschliff vervollständigen ein agiles Board für schnelle Kantenwechsel, gepaart mit enormer Stabilität. RIDER: Für den Rider, der die ultimative Leichtbauweise bevorzugt. Bindungen / Boots. Snowboard Jacken. - Terrain: Allmountain - Freeride. Hoodies / Pullis. Snowboard Hosen. Skate Protektoren. Wakeskates /-surfers. Hosen / Shorts. Eigenschaften: - Terrain: Allmountain - Freeride - Shape: Directional - Profil: FLF Dynamic Camber - Profil: Vorspannung (Camber) - Flex: Medium - Breite: Standard - Fiberglas: Biax. Used Palmer Liberty Snowboard 150cm Brilliant board with surface scratching on the top (see photos). Base in really good condition but needs re-waxing. Collect, post or arrange your own Courier - it’s up to you. It features a smooth lacquer finish and Klothoid shape with limited edition artwork by Hawaiian surf designers Nat and Mickey Woolley. The Burn is soft enough for technical freestyle riding, but torsionally stiff enough for high-speed turns. Awesome Smirnoff Ice Branded Snowboard Great for a beginner to intermediate boarder. Snowboard has seen two weeks. Rossignol snowboard bindings have had 7 weeks use. Palmer branded 152cm in size. A few scrapes as shown in photos. Will be fine after a service and a wax. The Halo has an easy-to-ride Klothoid sidecut and full sidewall construction. The board is light, assertive and smotth turning and has a a full length beech/poplar woodcore on top of an easy-to-fix isospeed 4400 base. Length 144cm. This board has a tip-to-tail poplar woodcore, full wrapped edges and a isospeed 4400 base. Stoneground inlaid 4400 iso speed base. Dual sidecut. Full length poplar woodcore. Full sidewall construction. 12degree more turning freedom. Reduced toe & heel drag. Simply put, the PLS is power steering for snowboards. The PLS also eliminates the dead spot that a binding creates on the board, allowing the board to flex the way it should.